Dual action sander, random orbital sanders. Internal threads on these sanders fit most of the backing pads on the following pages: Hook and loop pads , PSA pads . 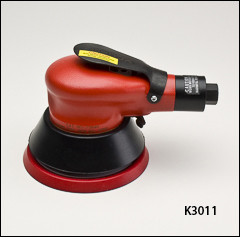 For additional sanders, please see our Inline sander , Palm sanders , Pistol grip sanders , and Right angle sanders pages. Sioux Force 0.50 HP with both a rotary and orbital motion for rapid removal or fine finishing. 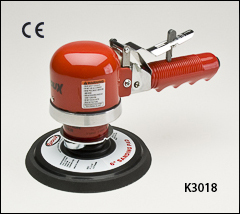 General duty dual action air sander used for blending and smoothing filler, feather edging, and pre-paint preparation. Speed regulator matches speed to the job. Lockoff throttle helps prevent accidental start ups. Vinyl grip and head cover for operator comfort. One 6" backing pad included. 5/16"-24 threads, 5.0 CFM, 90 PSI, 1/4" air inlet, 3/8" hose, 5" high, 4 lbs, 79 dB(A). Sioux 600 series 0.40 HP random orbital sanders for 5" or 6" PSA discs. Built-in speed control, aluminum housing, 3/16" standard orbit. An ergonomically designed housing with a palm throttle. Includes a PSA backing pad and wrench. Also available as a dual action model with a lever throttle and 5" PSA pad. Please call for pricing on that Sioux number 658 model. 5/16"-24 threads, 20 SCFM @ 90 PSI, 1/4" air inlet, 3/8" hose, 4.2" high, 2.9 lbs.